For the first time since the Great Recession decimated the U.S. economy, entrepreneurship is making a comeback. The rise of U.S. startup activity reverses a five-year general decline, according to the latest report by the Kauffman Foundation, a non-profit entrepreneurship organization. The 2015 Startup Activity report measures data through the end of 2014. “This rebound in entrepreneurial activity lines up with the strength we’ve seen in other economic indicators, and should generate hope for further economic expansion,” said Dane Stangler, vice president of research and policy at the Kauffman Foundation, in a statement. For every 100,000 adults, there were about 310 new entrepreneurs each month, compared with an average of 280 in 2014, according to the report. The jump marked the largest year-over-year increase in two decades. 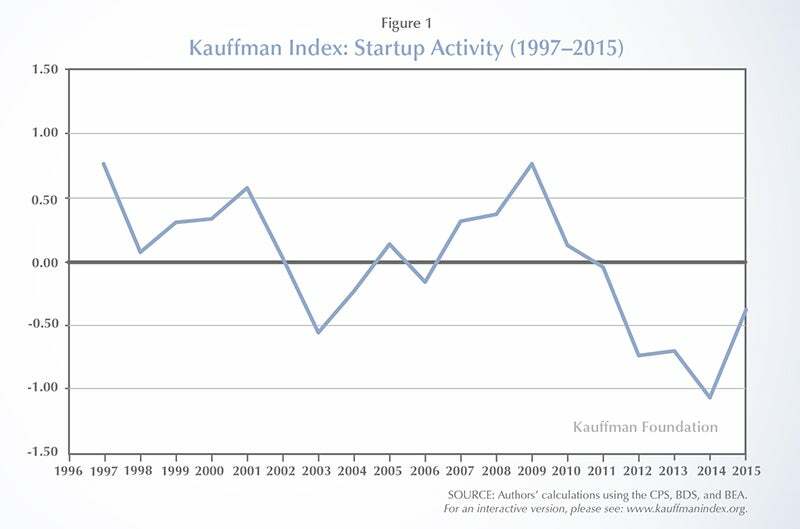 The rate of new entrepreneurship in the U.S. is only one of the components which the Kauffman Foundation uses to generate its annual Startup Activity Index. Another measure included is the percentage of new entrepreneurs who are starting their own businesses because they see opportunity, not because they are out of work and unable to get a job. These so-called “opportunity entrepreneurs” represented 79.6 percent of total new entrepreneurs, according to the latest report. That’s a small increase over last year and a healthy jump over the percentage of opportunity entrepreneurs in the years following the Great Recession. “Entrepreneurs starting new businesses because they saw market opportunities is back to historical norms,” said Arnobio Morelix, one of the study’s authors and a research analyst at the Kauffman Foundation, in a statement. Though the most recent snapshot of the startup ecosystem in the U.S. is encouraging, U.S. entrepreneurship is not yet back to pre-recession levels. “It’s important to view this short-term uptick in context of the bigger picture – we are still in a long-term decline of activity, which affects job creation, innovation and economic growth,” says Stangler.